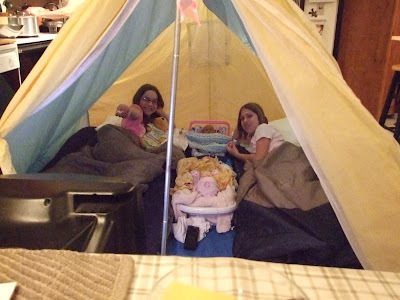 Beebewitz's Blog: I can't believe we actually did it . . . I said I would never do it. I said we (as in we, the Upsala Fire Department) would never do it. But we did it. We perpetuated an age-old misconception, a time-honoured fallacy. Firefighters don't really rescue cats from trees . . . but we did just that a few evenings ago. Here's me hugging the tree and dragging the reluctant cat, who is also hugging the tree with her twenty claws, and leaving twenty deep grooves in the bark, and demanding that I release her this instant on pain of having twenty deep grooves clawed into my face. And safely into her owner's arms. My friend Bill, who is a career firefighter from Thunder Bay, says they don't rescue cats. If you've been reading, you probably know that I've said we don't either. And we didn't until my pager went off the other evening. When the the voice on on the pager says, "Upsala duty officer, call dispatch," you know something unusual is only a phone call away. In this case it was two phone calls away . . . one to dispatch (to whom I said, "We don't do cats," and who replied, "I know you don't do cats), and one to the caller to tell him that we don't do cats. Except that the caller said he was sorry to bother us and he lived alone and the cat was his only companion and he would have climbed the ladder himself but he was physically infirm and he didn't know what else to do . . . and my resolve melted away faster than the snow in an El Nino spring. "Sure, we'll come have a look," I hear myself say. Then I hung up and wondered if I really said it. I went next door (where the deputy chief conveniently lives) to ask for back up, and within minutes (amid snickers and comments like, "I can't believe you agreed to this") we were at the scene of our very first bonafide cat rescue. The cat was distinctly ungrateful. 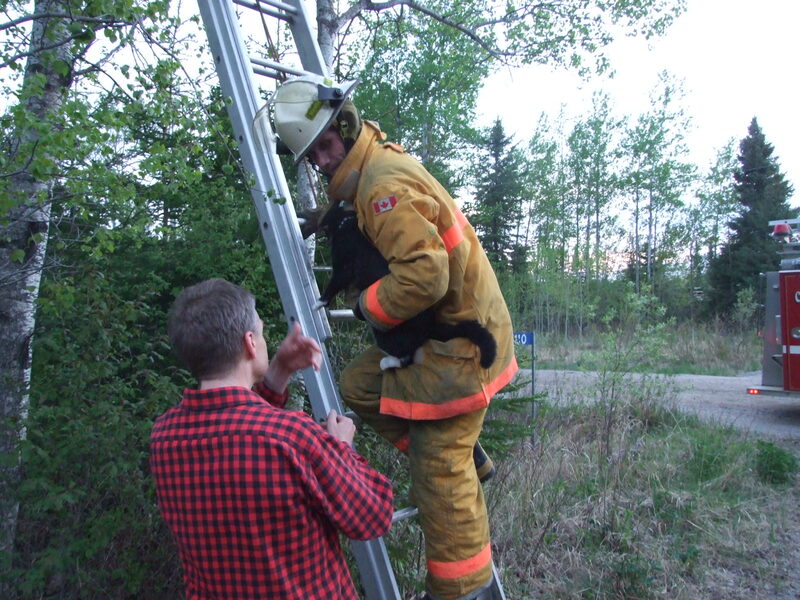 Fortunately I had opted to respond in full turnout gear, so her claws never made contact with my skin. Now I know why the other firefighters I know bring a shotgun to all cat rescue calls. The cat may not have been happy about us saving one of its nine lives, but the owner certainly was. When all is said and done, I guess that's what matters, right? 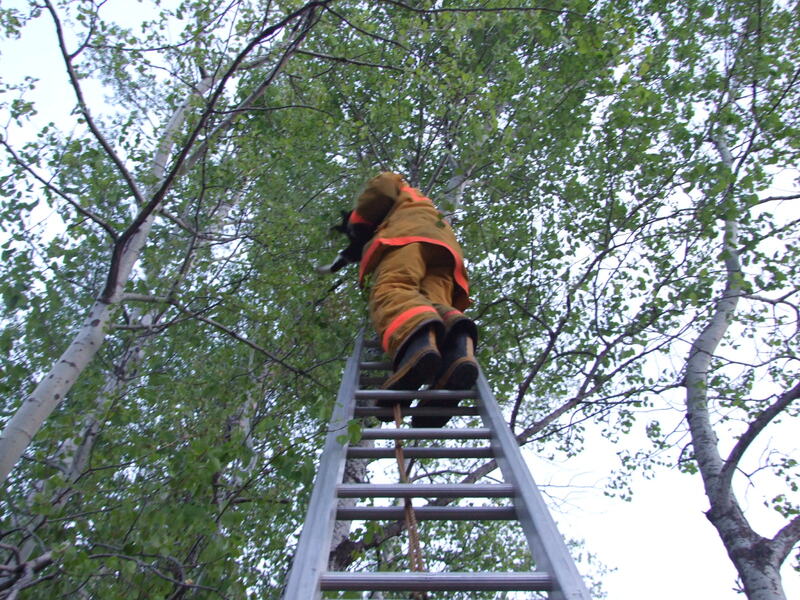 Except the cat escaped his loving arms before we had loaded the ladder, and promptly ran up another tree. Next time, I may just have to bring my shotgun. 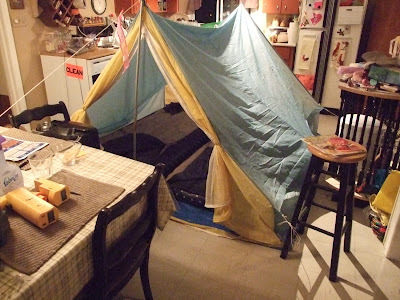 Vanessa and her friend wanted to camp in the backyard, but a bear has been hanging around lately, so they hatched a plot to camp in the kitchen instead (with the help of Erinn). Here they are, smug and satisfied and bear-safe, ready for the adventure. Yes, that's a TV in the foreground. 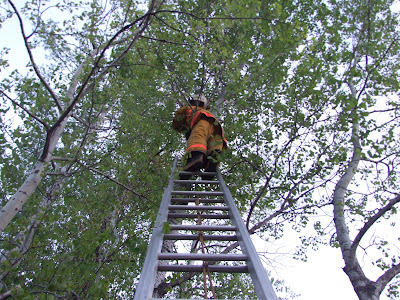 I may be a fearless, cat-saving firefighter, but I'm a pushover dad.